Colossal have worked with artist Cinta Vidal on an exclusive release of the print edition of her 2017 painting, Urban Evening. 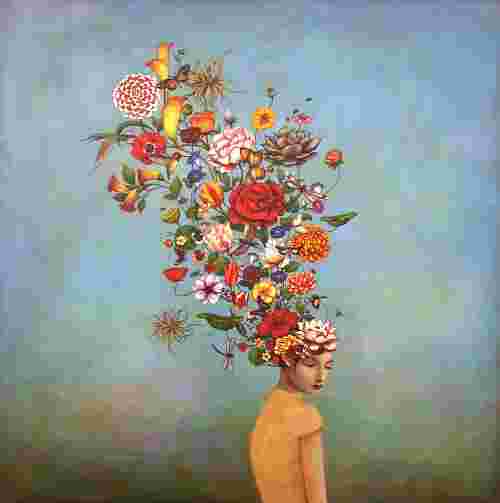 Vietnamese born Duy Huynh creates poetic and contemplative acrylic paintings. A post-human world, surrealist paintings. Capturing patterns and turning them into square format images of ethereal beauty. Assembling snippets of reality into intricate architectural collages. Using only black watercolor, Elicia creates unique relationship between human and nature. For generations, Kazakh fishermen have set out on the frozen Ishim River in the hope of catching fish beneath the ice. A Collaboration with Nobuo Tsuji and the Museum of Fine Arts, Boston. October 18, 2017 – April 1, 2018. Step into the alternate '80s universe created by a Swedish sci-fi artist. Turkish photographer and digital artist turns the streets of Istanbul into warped, Inception like photographs. Detailed drawings of imaginary cities of the past and the future. Cityscapes Set at Dawn and Dusk, oil paintings. Baroque-inspired dark drama and disturbing realism. Delicate sculptures made from metal flowers of bronze, copper, or silver. Christoph Niemann is an illustrator, artist, and author. His work has appeared on the covers of The New Yorker, WIRED and The New York Times Magazine and has won awards from AIGA, the Art Directors Club and The Lead Awards. Spread across the opened pages of books pinned against the wall, Ekaterina creates ink paintings that appear like fragments of memory. Image homage to some classic icons.